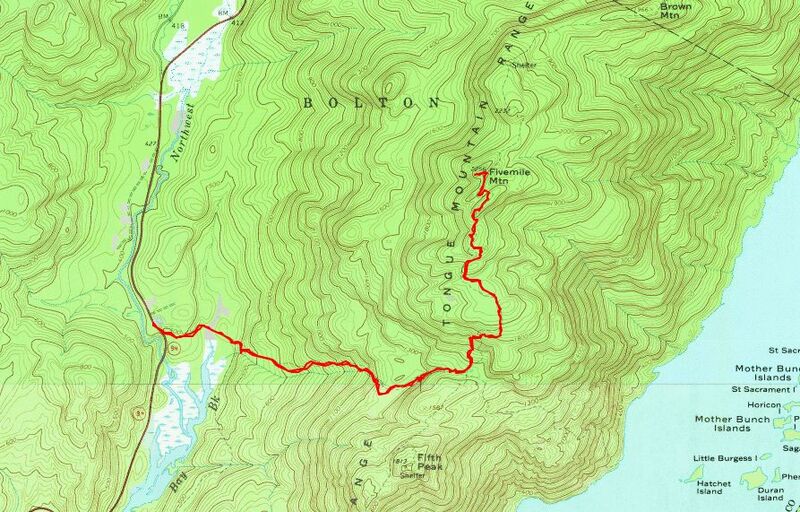 Most people who go for a hike on the Tongue Mountain Range, in the Lake George Wild Forest, start at Clay Meadows trailhead on Route 9N in Bolton, and head for Fifth Peak. There is a lean-to there, with perhaps the best view from any lean-to. You can see Northwest Bay, the Narrows, and almost down to Lake George Village. From the same trailhead you can access the Tongue Mountain Range Trail and head north towards File Mile Mountain and beyond. This section of the trail doesn't see as much use, but it is a beautiful trail. 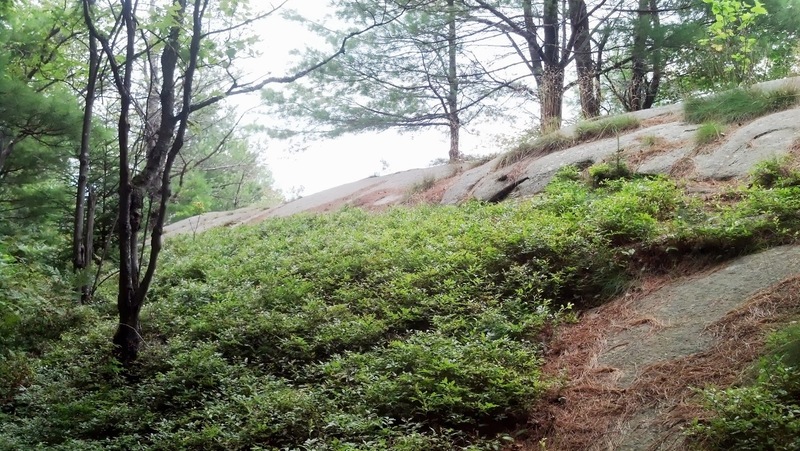 Nice rock formations, soft pine needle trail, some views. The route starts out from Clay Meadow on the Northwest Bay Trail leading you across Northwest Bay Brook. After 1/2 mile, Northway Bay Trail turns right to head south and follow the shoreline of the Tongue Range with NW Bay. 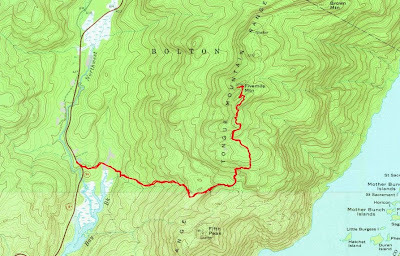 If you continue straight instead, you begin Five Mile Point Trail which takes you 1.5 miles to the ridge of the Tongue Range. From the intersection with the Tongue Mountain Range Trail we turned north to climb another 1.5 miles to Five Mile Mountain. If we had turned south, we would have reached Ffrth Peak in .7 miles. 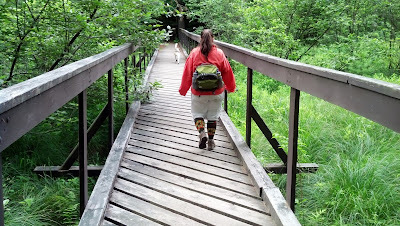 We didn't see any hikers on the Tongue Mountain Range Trail, although we did see two tents set up as we got close to Five Mile Mountain. 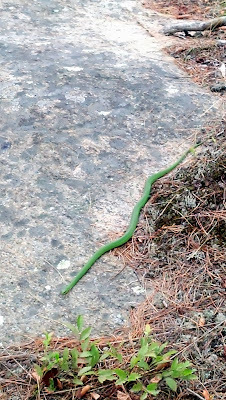 When we reached the false summit before the top I saw a solid green snake which I had never seen before. It was a bright green color. 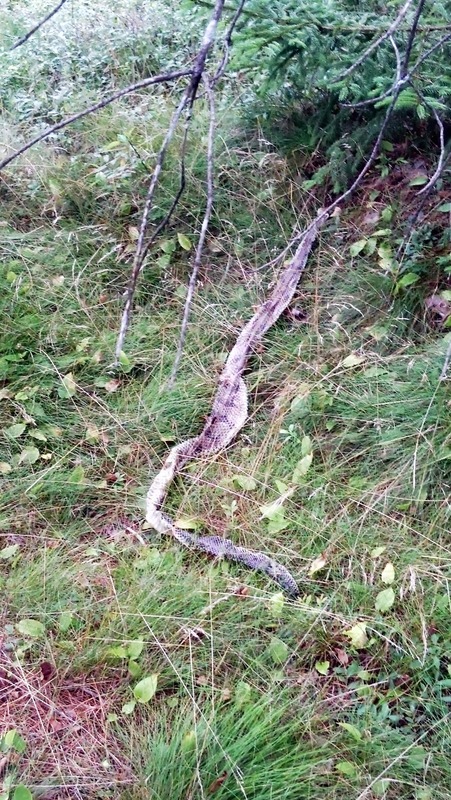 The snake was about 18" long, and not much bigger around than a pencil. I later looked it up, and it seems that it was a Smooth Green Snake. 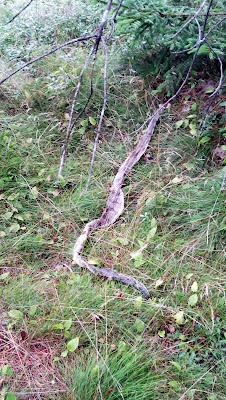 Nearby, we saw a skin that had been shed from a timber rattlesnake. It was probably 3 feet long, maybe 3-1/2 feet. 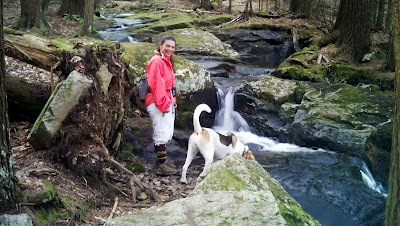 We kept our eyes open for further signs of snakes, but didn't see any. 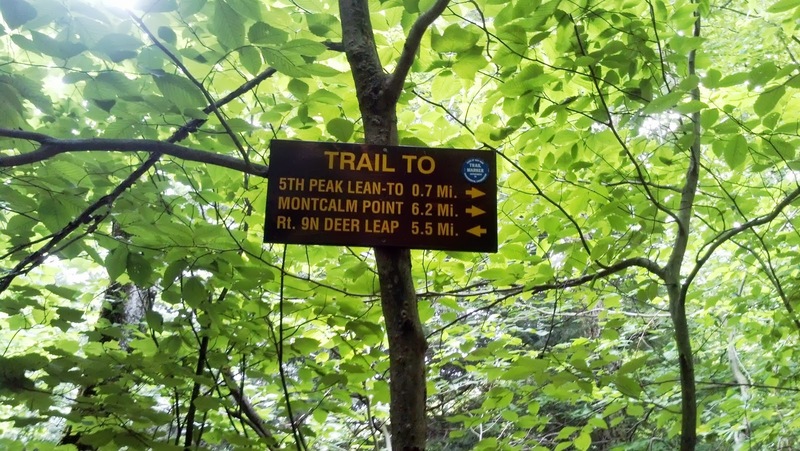 As the trail continues northward, it doesn't go up and over the actual summit of Five Mile Mountain. It goes just east. We left the trail to climb the final 50' to the summit. There is some nice open rock, but views are limited with the leaves on the trees. 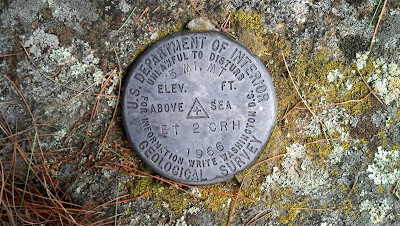 The USGS summit disc was somewhat hidden under a pine bough. The weather was just about perfect and we stopped to have lunch on the summit. Going down, we retraced our ascent route. 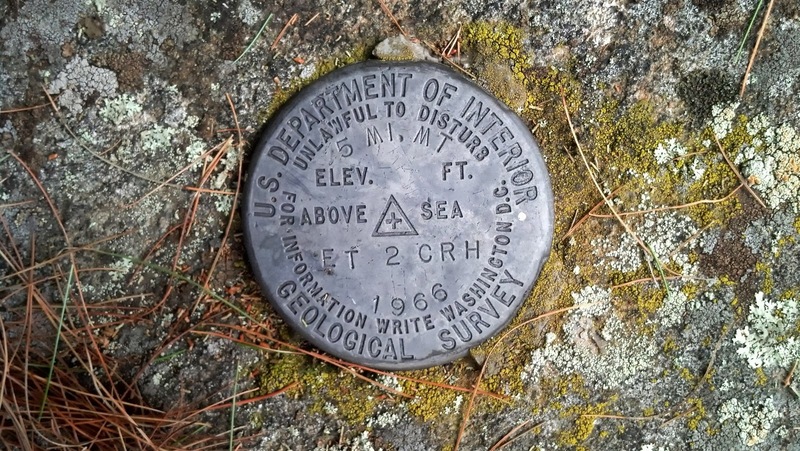 Overall the hike was about 3.5 hours, including lunch time on the summit. Hi there! How far is the bridge from the trail head? Thanks!